Siney Avila (c), of the Republican Party of Cuba, receives the medal of freedom from the hands of Florida Governor Rick Scott (l), Friday, May 19, 2017, at the ceremony held on the occasion of The Independence of Cuba that is remembered every May 20, at the Museum of the Cuban Diaspora in Coral Gables, Miami (USA). The “freedom fighters” in Cuba and Venezuela were honored today during a ceremony in Miami, Florida, in which Florida Gov. 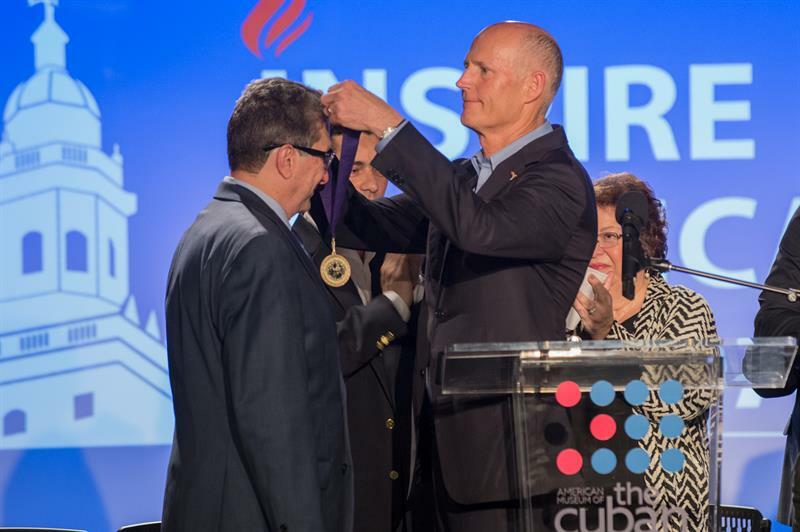 Rick Scott handed the Medal of Freedom to two Cuban opponents. Developed in the Museum of the Cuban Diaspora, at the ceremony held on the occasion of Cuba’s Independence Day, which is remembered every March 20, Scott presented these awards to opponents Sirley Ávila León and Pedro Corzo “for their work for the Democracy and freedom “on the island. “It is important that one day like today we are honored with the Medal of Freedom, because we are part of a people that has lost 58 years ago,” said Corzo, who currently chairs the Institute of Cuban Historical Memory against Totalitarianism. “We are part of a people that has had more than half a million political prisoners for 58 years,” added the author of books such as “The Porphyry of Reason” and “Guevara, Anatomy of a Myth,” and who came to the United States After having lived twelve years in Venezuela. “We hope to have freedom and democracy,” Avila said after receiving the award. Shortly before giving him the medal, Scott recalled that by his activism Ávila was attacked by machete in 2015 by a rural worker who cut his left hand and caused cuts between the shoulder and head, thighs and knees. Avila is an activist of the Republican Party of Cuba that was delegated of the Municipal Assembly of the Popular Power in Las Tunas and began to dissent of the Castro regime in 2012. The event organized by the Inspire America Foundation did not ignore the “freedom fighters” in Venezuela, who are struggling to change the destiny of the country and the region, as stated by the president of this organization, Marcell Felipe. Cuban journalist Pedro Corzo (l) receives the Florida Governor Rick Scott’s medal of freedom Friday, May 19, 2017, at the ceremony held on Cuba’s Independence Day Is remembered every May 20, at the Museum of the Cuban Diaspora in Coral Gables, Miami (USA). “Venezuelan opponents are our inspiration,” said the recipient last month of the Medal of Freedom, and who was sitting next to Cuban opponents Cary Roque and Angel de Fana, two others recognized by the Government of Florida with the aforementioned distinction. The exiled Carlos Vecchio spoke on behalf of the Venezuelan opposition and began his speech calling for a minute of silence for the 50 dead, many of them young, during the demonstrations that have been held in Venezuela for a few weeks. “When we talk about the fight for human rights and democracy there are no borders,” said the political coordinator of Popular Voluntary, the party of the imprisoned Leopoldo López, who was also given last month the Medal of Freedom, received in His name by Vecchio. “Their struggle is also our struggle,” Vecchio said, sparking the applause of the crowd. Speaking to the media, Governor Scott said that the Cuban and Venezuelan people deserve “peace and freedom” and that all citizens of democratic societies should defend those who do not live in freedom.